Ugba is one of the Nigerian restaurant specials. 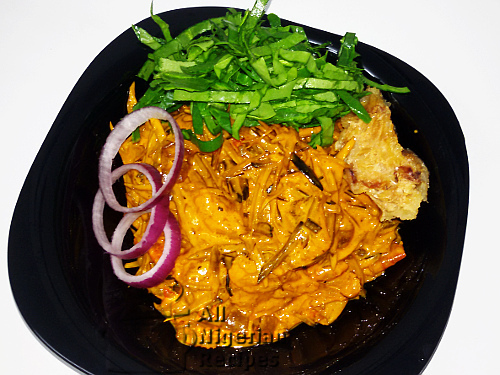 It is a traditional Igbo meal prepared the same way as Abacha (African Salad) but with Ugba, instead of using ugba/ukpaka as just a side ingredient, it is the main ingredient. If Abacha is like cooking Ukwa na Oka (Breadfruit with Corn), Ugba is like cooking only Ukwa (Breadfruit). Ugba (Ukpaka) is known as an exclusive and expensive ingredient so if you prepare Ugba on its own instead of adding abacha, you are seen by many as someone that lives large. Mr/Mrs Chopping Life! Ugba (also known as Ukpaka in some Igbo dialects) is oil bean seed. It is cooked for long hours and shredded before use in Nigerian meals. 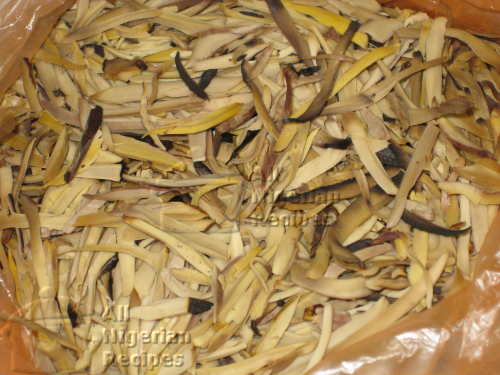 You will often see it used in preparing Ugba the meal detailed on this page, in some parts of Igboland it is added to Isi Ewu and it is a major ingredient in Abacha (African Salad). Powdered edible potash is used to make the red palm oil curdle. 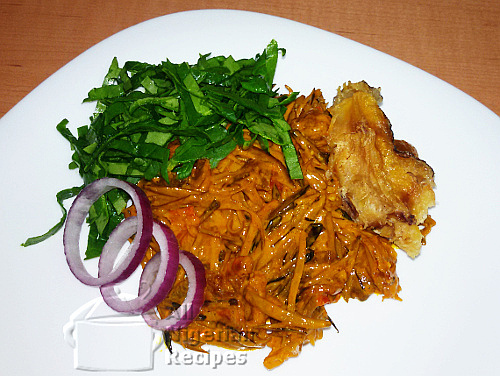 The recipe for Ugba requires the red palm oil to be in that state. Baking soda, which I used in the video below is the perfect alternative to edible potash. Watch it in action in the video. Please note that the medium crayfish stated in the list of ingredients is not oporo (large dried prawns). By medium crayfish I mean when you buy crayfish, you have some that are quite big but not as big as oporo. I usually pick these out and keep them for preparing Ugba. Ogiri Igbo is a very traditional Igbo seasoning made from castor seeds. If you do not have it, skip it. Ponmo is cow skin. Raw cowskin is burnt to remove the hair to get the ponmo. If you do not have ponmo, use cow tripe (shaki). Stockfish is dried cod fish. If you do not have it, smoked mackerel (smoked fish) is the next best thing for this Ugba recipe. Rinse the ugba/ukpaka and place in a sieve to drain. Cook the stockfish and ponmo with the stock cube till done. Take them off from the pot. If the stock from cooking them is too much, keep boiling till most of it has evaporated and you have about a quarter cup of stock. If using smoked fish to replace stockfish, do not cook it, just break into small pieces with your fingers and add in Step 4 in the preparation directions. 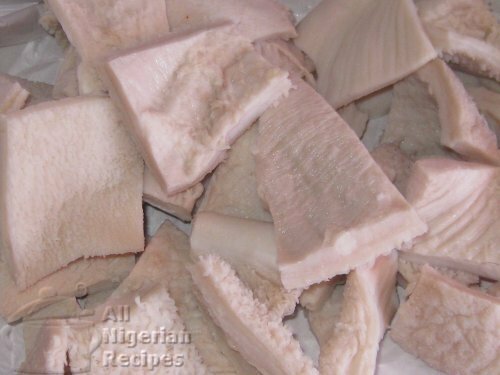 When the stockfish and ponmo have cooled down, cut them into small pieces (see video) and set aside. If you want to serve the Ugba with a lump of stockfish, remember to cook that one with the first one but do not break it into pieces. Dissolve the edible potash or baking soda in half cup of cool water and set aside. If using edible potash, stir very well and pass the mixture through a fine sieve and set the resulting liquid aside. 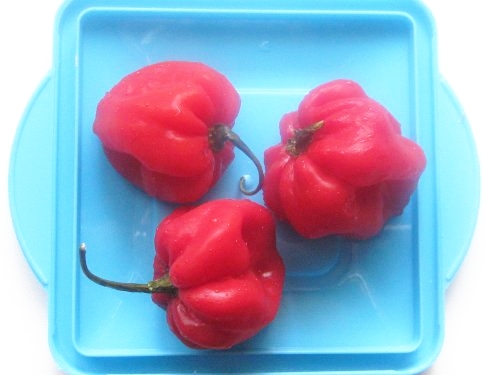 Cut the habanero peppers (atarodo, ose oyibo) into tiny pieces. Break up the medium crayfish into small pieces with your fingers. Grind or pound the normal crayfish if you do not have already ground ones. Cut the red onion into rings and set aside. This is for garnish. Rinse and slice the garden egg leaves. This is also for garnish. Pour the palm oil in a pot. This is done off the stove. But if you need to melt the red palm oil, you can melt it and take off the stove once the palm oil melts. Stir the edible potash solution or the baking soda solution then slowly pour into the palm oil while stirring at the same time. You will notice the palm oil slowly turn yellow and curdle (become thicker). Add the ogiri Igbo to one corner of the pot/pan and dissolve it with your spatula. Add the ground crayfish, the pieces of medium crayfish, the pieces of stockfish and ponmo then stir till everything is combined. If using smoked fish, add it now before stirring. Transfer the pot/pan to a stove and set the heat to medium. Add the ugba/ukpaka, sliced habanero pepper and the stock from cooking the stockfish and ponmo. Continue stirring till everything is combined and once it heats up, add salt to your taste, stir again and take it off the stove. Serve with the sliced garden egg leaves and onions. Serve with chilled Palm Wine, Guinness Stout or any other chilled drink if you do not drink alcohol. If you have any questions about this recipe, click here and ask me.